@MacBreck @pinojo please tell me that B5 is being reborn! If so, you made my day! So, I asked JMS on Twitter and got no response, though I'd have been shocked to get a response from him. Maybe, I committed an affront or slight by asking about B5 at a time he rolling out Sense8 ? Maybe he has me muted. I dunno. <shrug>. I haven't been paying attention to JMS for a long time. About the only B5 related thing I'd really be interested in, now, is a continuation and completion of Babylon 5: Crusade in novels, and I'm NEVER going to get that because JMS isn't interested. * However, I would have seen and supported it due to loyalty to B5 (1993-1998) & Crusade (1999). Last edited by KoshN; June 5th 15 at 12:18. For some reason last August's article about the announcement at SDCC is making the rounds again as if it were new. Don't know why. No, there's no news since the announcement. I never really expected any. Sense8 was already in production at the time the announcement was made and filming continued to late October, as I recall, except for some flashback scenes in Iceland that had to wait until there was snow in late December or early January. Then came editing and post-production. So he's been busy. Hopefully there might be some news at his spotlight panel at SDCC next month. I'll be sure to make the rounds and keep people posted if so. As for committing an affront...why would you think that? Were you rude? When did you ask? If it was in the last week, the #FreeBabylon5 campaign may have been flooding his feed. I asked people to Tweet Netflix and I noticed that a bunch of people included his Twitter handle in those tweets. @B2Bspecialist @pinojo @straczynski IMO, the last good thing in the B5 universe was B5:Crusade. DAMN YOU, TNT. @B2Bspecialist @pinojo @straczynski Keep an eye on things at http://t.co/GLNyNSDJfD in B5 Related forum. @B2Bspecialist @pinojo @straczynski IMO, the last good thing in the B5 universe was B5:Crusade. DAMN YOU, TNT-Atlanta. You can change tweets after they've been sent? Isn't that kind of too late? Or did you re-send them? I copy the existing tweets to a new draft email in gmail (It's just a scratchpad area really. ), delete the tweets, type the new tweet text in the email draft, go to the place in twitter where I want to put the new tweets, copy and paste the text from the email draft, and then send the new tweets. The thing is, you have to retweet the tweet you're replying to, so it's sitting in your tweet history so you don't lose it due to scrolling. Otherwise, you lose the place to hang the replacement tweets. Alternately, you can put up the replacement tweets before you delete the old ones. For this time, I just went to the Photos on my twitter profile page, scrolled across to the B5 & Crusade pictures that were there because they were in mu "Ahem." tweet, clicked on the link to the tweet at the bottom, and went to the thread that way. I get migraines so news about tweeting and retweeting untweeting or whatever doesn't bother me. Plus I don't tweet anyway....Facebook takes up way too much of my time. I did see people posting and mentioning a B5 movie in 2016 in the B5 Facebook group that I belong to, but there really wasn't much more than speculation and questions.....not much info given. Whenever I see those threads I try to post the link to the transcript from the panel where JMS made the announcement. I'm sure some people are tired of seeing it but at least it's 'from the horses mouth' so to speak. No real news, but here's what JMS recently said in an interview so apparently the plan is still in place. 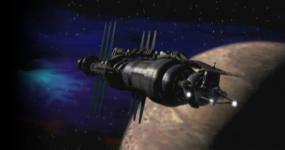 N: One last question… What can you tell us about the current status of Babylon 5? Will we see more? JMS: I still maintain the film rights to Babylon 5, although Warners owns the television rights. I would love to do a feature film in the Babylon 5 universe and kind of reboot that for a larger audience, with a proper budget that we never had on the series. So I’m hoping this year to write a B5 screenplay, and then get it financed at a proper level and then do it in 2016 and reboot the franchise. It couldn’t be a continuation because we’ve lost several actors and not enough folks saw the original. It would be a reboot. Reboot or not I'm really interested in seeing more B5. It's been far too long and I've been going through withdrawal for years. I don't think anything will ever top the original, as the casting was near perfect but I do think JMS will do a good job or else he wouldn't do it.